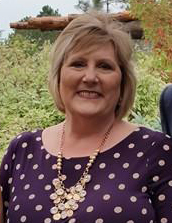 Debbie Walton has served at Premier Designs, Inc. for 15 years after being a long-time Hostess. Her journey through breast cancer is how she arrived at Premier’s Home Office for an interview. Her hope is that “maybe as an 18 year Survivor my story will provide enCOURAGEment to someone else.” She has two married children and a dog named Dirk, after her favorite Dallas Mavericks player. In March of 1997, I was planning a large outdoor event for Harvest Baptist Church, where I worked as an administrative assistant over publications and special events. It was a highly stressful time for me because this event was going to compete with the annual MayFest in Fort Worth. I had just turned 40 in January, and my children attended middle school in the church where I worked. Little did I know this would pale in comparison to what was coming my way. As a young lady, I was fortunate enough to visit a gynecologist that taught me about self-examination, and so I practiced this throughout my young adulthood and into my later years. While in the shower one morning as I was getting ready for work, I performed my self-examination in an area where I felt some burning discomfort. It was not a pain, just a nagging burn similar to heartburn on my right breast. I checked the area, as I usually do, but this time was different. I felt something there. Not too worried, I showered and then performed the self-examination “part 2” by lying down on the bed with my arm stretched upward. The lump was still there. I wondered what to do next. I spoke with my Pastor/boss, and he prayed with me. I spoke with my husband, and then scheduled an appointment with my general practitioner. After examining me he confirmed there was definitely something there. He scheduled an appointment with the lab, where I had my first ever mammogram. There was no history of breast cancer or ovarian cancer in my family so I wasn’t considered high risk. I’d planned to have a mammogram that year at my annual physical, scheduled for June. During this time (1997), there was a big debate on the benefits versus hazards of yearly mammograms. Just a week after surgery, Debbie and her family attended the Harvest Baptist Church event she planned. Pictured here with Paul Overstreet, country music singer and songwriter who was performing at the event. My sister-in-law went with me to the appointment. They preformed the mammogram and then wanted to do a sonogram as well. I thought this was standard procedure—I didn’t know any better. They never said anything to me except that I needed to follow up with my Doctor to receive my results. I had just left the parking lot of the lab when my Doctor called. He informed me I had an appointment with the surgeon that day at 2:00 pm! Things had moved very quickly! I met with the surgeon who explained my mammogram showed a suspicious lump. He could do a needle biopsy, however he was certain he would eventually have to do surgery and encouraged me to do a surgical biopsy. My family and Pastor were at the hospital when the surgery happened. When I awoke in recovery, my husband, Pastor, and surgeon confirmed the diagnosis. It was like I knew what the outcome was going to be, and I was at peace. You know the scripture Philippians 4:7, “And the peace of God, which transcends all understanding, will guard your hearts and your minds in Christ Jesus?” This scripture was my peace. During the healing process, I continued to have this feeling of peace. The big event I was planning at work happened the weekend after I was released from the hospital. I was able to attend with the assistance of my family. frightening and exciting all at the same time and God was with me every step of the way. I changed job positions to eliminate the stress and spend more time with my children. Then after 13 years of marriage, I found myself single again. 15 months after chemo, I had no real job and two children about to graduate high school. I ran into one of my really good friends at our daughters’ basketball game in 2001. She asked what I’d done that day, and I told her I didn’t have a full-time job. She said, “Let me make a phone call.” She called Premier – James Johnson to be exact – and I had an interview the next day. I was hired on the spot! I didn’t feel like anyone would want me. I was damaged and had just finished chemo 15 months before. Were they really going to take a chance on me? Little did I know. “God didn’t take the time to make a nobody” was a quote I would hear year after year from our precious founders, Andy and Joan Horner. Yes, Premier did want me, and 15 years later, they are still taking a chance on me. Today – Debbie with her two children and their spouses. During my time at Premier, I have experienced unconditional acceptance, guidance, love, and support—mentally, financially, and spiritually. As a result of this support I was able to fulfill my dream of getting a college education. In 2011 I graduated with honors from Dallas Baptist University. I have been able to send my children to college, purchase a home, travel, meet new friends, and grow as a person. Premier was a safe port in the storms of my life, and I can say I am truly changed because of it. I can honestly say, I am at Premier by design. An amazing story! I did not know Debbie had been through this but am so thankful she shared her story of God’s amazing grace, mercy and healing. God will use it to encourage others. Premier by design!! Debbie — what a beautiful inspiration and blessing you are! May God continue to bless you, always, and may others draw peace and hope through your inspiration!! I am also a 15 year Breast Cancer Survivor, and my story is so similar to yours, my children were ages 3 and 10 years when I learned I had breast cancer. I had a red rash that wouldn’t go away, thankfully, I asked the doctor to look at it. Thank God, I did since I was “PtoMom” and school had just started and I would be busy at my son’s school. Good luck and know that God is always looking over us, and always encouraging us. Debbie, Thanks for sharing your amazing journey in life! God has blessed you & now letting you share his grace & healing! You are a wonderful example for All of us! Definitely Premier by Design! Mom, going through this you often forget the details and the emotion. You did a great job of encompassing so much in such a concise manner. As I learned when telling part of our story last year we have been through more than what people know. But for us all to come out like we have is nothing more than devine intervention. I love you Debbie Walton! What a beautiful story of strength, courage, faith and victory! Debbie, you have truly been blessed by God! God is so great. I am very thankful that Premier wanted you! God does work in mysterious ways and there are a lot of us He brought to Premier “by design” just when we need it most, or to prepare us for what was to come! Thank you for sharing and blessing to you and your family…Premier and Birth!! Thank you for taking time to share your story and give so many encouragement and hope. You are a true blessing. Debbie thank you for sharing your story!!! You are amazing!!! Debbie, even though I feel like I’ve known you forever, I actually never knew your story! Wow! Thank you for sharing with everyone! Debbie! I am amazed of your story and how little of it I knew. You are one strong woman and I thank you for sharing what God has done in you and thru you as you share your story. What a blessing you are to Premier and to all of us who know you. Much much love and respect! Thank you for sharing Debbie. What a wonderful God we serve! God’s continued blessings to you and your family. Thank you for sharing your story here. What a witness you are to God’s love and plan.